Examining Foam’s Density, Weight, and Firmness Characteristics – Foam Factory, Inc. In business and industry, words are frequently taken from everyday vernacular and re-defined to serve a specific purpose. These niche languages can unintentionally mislead or confuse people who are familiar with the common meanings of words and phrases, but not an industry’s jargon. Compared to other industries, foam is relatively uncomplicated and easily understood, but at Foam Factory, Inc., we feel it is important to clarify a few misnomers and assumptions about foam and foam products to help individuals identify the best products for their jobs. If you were to tell a person on the street that foam has density, weight, and firmness characteristics, he or she would likely understand, given that they’re all common terms. However, one of the biggest misconceptions regarding foam is how interrelated these characteristics are. It would seem that in everyday terms, the density of a material or the weight of a material would have a direct correlation to its firmness, and vice versa. But in terms of foam, density and firmness are exclusive of each other and separate values for evaluating a product. Density is a foam characteristic that is often over-applied, rather than misunderstood. On a basic level, foam density is the same as any other application of the definition, being the quantity or mass of a material per a measurable size or volume. This applies to all varieties of foam, open and closed-cell alike. Density is found by weighing a 1 cubic foot block of the material. So, if a mattress or cushion is said to have 3LB density, that means that the material being used, when cut into a 1 cubic foot block, would weigh 3LB. Most importantly though, is recognizing that density is an independent characteristic and not in direct correlation with the feel of a product. While density doesn’t refer to the firmness of a product, it is able to be applied as a way of measuring a product’s longevity and resiliency. Open-cell foam is made of tiny bubble-like cells that are not completely closed off to one another, allowing transmission of air and fluid. Density is impacted by both the size and thickness of these cells. The thicker a cell wall is, the more weight and pressure required to flex it and, eventually, break it down. A physically smaller cell means there is more material and less air in the foam, increasing the amount of performance material in a product. Most conventional foams fall in a density range of 1LB to 3LB. High density foam is best used in applications that receive heavy or daily use, like couch cushions, mattresses, and automobile seating. Lower density foam is excellent for comfort applications like pillows, body bolsters, or mattress toppers that receive less frequent use. Density is also sometimes referred to as weight, which is a more literal interpretation of the characteristic. Density and weight are sometimes used as interchangeable terms. Because of this, if knowing the weight of a product is important, be sure to specify that you need to know the physical weight of the entire product, and not just the density of the material being used. For example, take a 6-inch thick, queen-size mattress with a 2.8LB density. The material weight is 2.8 pounds; the material’s density. However, the overall weight is about 46 pounds, obviously two very different specifications. Firmness, on the other hand, is reflective of the feel of foam and how it carries and yields to weight and pressure. It is measured with a value called Indentation Load Deflection (ILD). It is also known as Indentation Force Deflection, or IFD. ILD is measured by taking a 15 inch by 15 inch by 4 inch section of foam and measuring the force in pounds that it takes a 50 square inch circular plate to compress the material 25 percent of its thickness. If a foam section requires 36 pounds of pressure to reach 25 percent compression, it has an ILD value of 36. It is important that the material being tested adheres to the dimensions stated, as thicker and thinner cuts of the same material can deflect weight differently. A firm material will require more force to reach its compression value, and a softer material will require less force. Typical ILD values range from 8 to 70, with some materials reaching as high as 120 to 150. Firmness testing assesses how a material will carry weight in its end-product application. 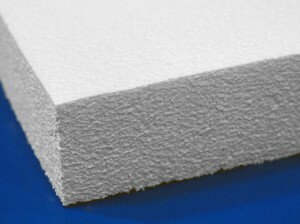 Based on structural and chemical makeup, some foam sheets with higher densities can have lower ILD values than foams with lower densities. For this reason it is important to look at the two values independently and use them to match your preferences to a product. People who want firm support from hard foam would want products with higher ILD values, and people who desire comfort products with soft foam would want foam with a lower ILD. Knowing the differences between these two characteristics and what they do and do not represent is a major factor in deciding what kind of product best fits an application. Finding where your desires fall within each value is an excellent way to pinpoint exactly what you want in a product. For more information on density, weight and firmness and how they apply to you, don’t hesitate to contact us to help you find exactly what you need. I am looking to obtain the weight of a 1.7# polyethylene foam product. Is there a mathematical equation to determine weight by the board footage? Do I need more than the density to calculate weights? You need size and density to calculate weight. For example, a sheet of PE foam sized 1″ x 48″ x 108″ with a 1.7LB density weighs approximately 5.1 pounds. So the math for that would be 1x48x108 = 5,184 cubic inches. 5,184 / 1,728 = 3 cubic feet. There are 1,728 cubic inches in a cubic foot. Take 3 cubic feet x 1.7 density = 5.1 pounds. I need to match the ILD of a cushion on a couch I already own. What is the ILD of your various cushions? 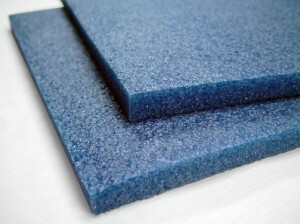 Our Foam Types page describes the different foam types we carry for cushion foam, including the ILD information. What density/weight foam would be best for floatation? This would be added to the side of a canoe and would occasionally bump against docks, rubbed against by paddles and get a fishing hook stuck in it. I would suggest our 2.2lb polyethylene foam for your application.